In our most recent stable release of Google Chrome, we talked about beta-testing Adobe Flash Player integration into Chrome. We’re now happy to enable this integration by default in the stable channel of Chrome. To read more about this integration, check out the Chromium blog. In testing Flash Player integration into Chrome, the Chrome team admittedly spent many, many fun hours with a few of our favorite Flash-based indie games. So as a side project, we teamed up with a few creative folks to build Chrome FastBall, a Flash-based game built on top of the YouTube platform. 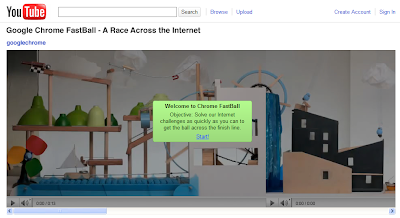 Try pitting your wits against the clock at youtube.com/chromefastball. If you’re using Chrome, your browser should be automatically updated with Flash Player integration as of this week. And if you haven’t yet tried Chrome, download this newest stable release of the browser at google.com/chrome and take it for a test drive! Update 9:20 AM PST: Due to the overwhelming response to the game, some things aren’t quite working as we hoped due to server-side overloading. Please forgive the maintenance work as we get the game back up again. Thanks! Update 2 6:00 PM PST: All technical issues have been resolved now, so you can enjoy the game. Thanks for your patience!